Wide family of games based on image interpretation. Good usage for inspire cards. You'll need interpretable images to play. Inspire cards were made for this very purpose in mind, but you can use any set of images you'd like. The exact amount you need will depend on a chosen ruleset and number of players. Two inspire decks (32 cards in total) will be enough for any example game presented below for 7 participants or less. The examples will show cards with colours. The option of interpreting colours is available for these games, but might be very, very hard. 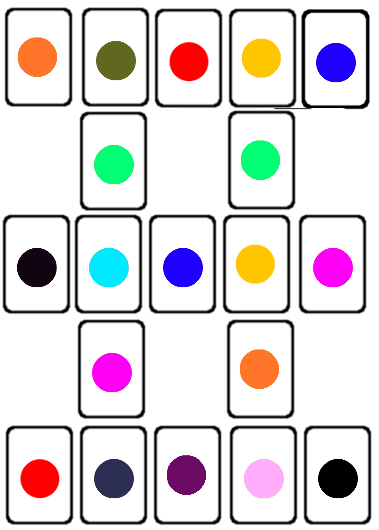 At the beginning of the game, shuffle the image cards and deal them to form a set pattern at the table. The pattern will serve as a board for Players — at any moment of the game every Player will be "at" some card. No pawns or other indicators of position will be used — every Player should know where he or she is. Player interprets musically the image of the card he or she is at — this is treated as a signal of your position to other Players — bear in mind though that being too obvious with the signal will most probably be bad for music. Players will be expected to move from one card to another, but the music should be fluent and without clearcut stops in between the images. Everyone will play music for all the time of the game. 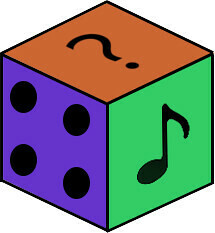 During the game, communication (verbal and non-verbal) is not allowed, apart from the played music. Also, no strategic pre-agreements should be made — factors not defined by the ruleset (e.g. timing or direction of movement depending on a variant) should be decided during the playing judging by preferred musical outcome. 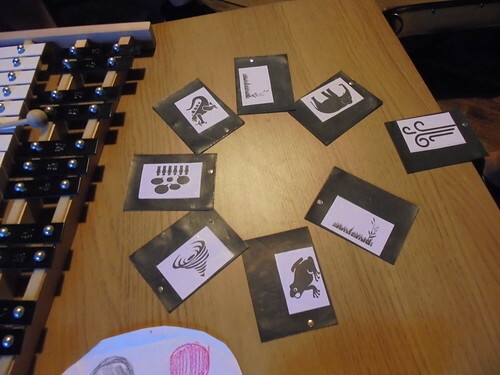 Pattern: Circle of 8 cards with the last dealt card marked by moving it a bit out of the circle. Start: Everyone starts at the marked card. Movement: Players move clockwise to consequent image cards and movement timing is not signalled or coordinated from outside — finding the timing of the move is the very heart of this game. End: Move full circle to end the piece at the same card you started. Task: At any moment during the game Players should try to stay together at the same card (don't spread to a distance more than two cards apart). The success of that can be evaluated in the discussion after the game. If you have a short hourglass (3-5 min), you can add the constraint that the full circle should be done before the time runs out (don't display a digital timer though, because players will just proceed in even intervals). This game works better with even amount of Players. Choose the Player that will signal the end of the first turn and make sure you can follow the order of Players (e.g. if you sit in a circle, go clockwise). Pattern: Pyramid with 6 cards at the base. Start: Everyone starts at the single card at the top of the pyramid. 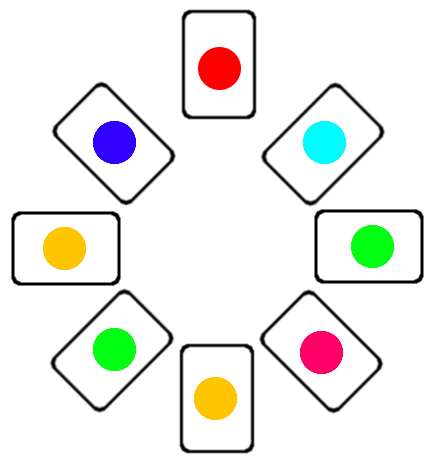 Movement: Every round is signalled by the next Player according to the order you established before the game. 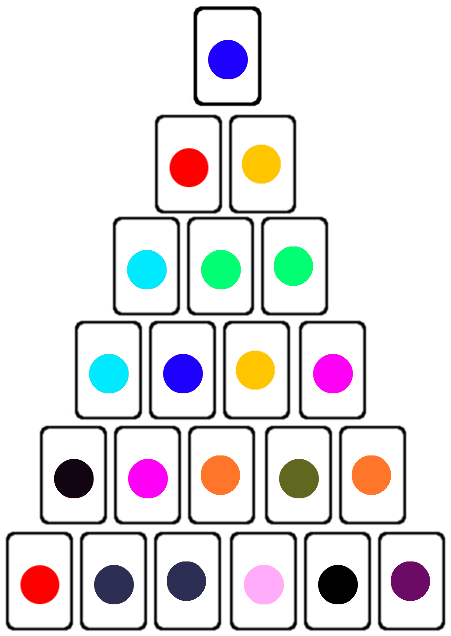 At every round Players should individually move one step down the pyramid to the neighbouring card (down-left or down-right). End: Everyone should arrive at the bottom of the pyramid at the same time to end the piece soon after. Check at what card every Player ended. Task: Look at the bottom of the pyramid and check 3 left cards and 3 right cards. Your task is to have at the end equal amount of Players in both halves (±1 if odd number). If you have a very short hourglass (< 1 min), you can treat it as a signal for step down. One player will be tasked with taking care for the hourglass. Pattern: Pattern depends on the amount of participants. The example is for 5 or 6 Players and this number is optimal. You may need to shorten or extend the pattern vertically to have enough starting points (see below). Start: Starting cards are those that are adjacent to only one another card (6 of these in the example). These few cards should be dealt first and after they are on a table every Player will pick and announce one of the cards as his or her starting point before the rest of the pattern is dealt. Try to pick the image that best suits your instrument. If you have 5 players, don't start at the pink starting cards (and deal it when starting points are picked). Movement: You move between neighbouring cards in any direction you want. Timing of movements is free. End: Ends when every Player moves from his or her starting point on one side of the pattern to a freely chosen starting point on the other side of the pattern. Your target point should not be at the same level as your starting point (e.g. red can aim for blue or pink, but can't end in black although might visit it on the way). Task: You should never be at the same card as any other Player (if you'll not hear it, discussion will show if you won or not). If that "hit" happens to you, get back to your starting point. For these type of games discussion after the play is very useful. During that discussion consider finding some modifications to the rules. Possibilities are endless, and if you find something fun to play, please add it to the library.